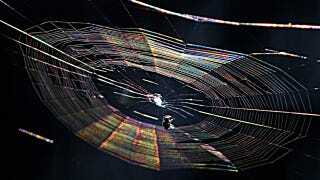 Why is this spiderweb full of rainbows? This is as joyous as any spiderweb is ever going to look. Either spiders are killing pixies and smearing their colorful blood on their webs (I wouldn't put it past them) or something else is going on here. What we're seeing is the result of diffraction. A strand of spiders silk is only two to three times the size of a wavelength of visible light, so the two interact significantly. When a wave of light hits the web, it gets scattered in many different ways. The wave moves around the web, or it gets reflected by the web, or it sometimes moves through the material of the web. Exactly what happens depends on the angle of the light, the thickness of the specific strand of web, and the slight imperfections in the surface in the strands of the web. The white sunlight that was coming at us in a good solid chunk before it hit the web is now broken up into pieces. One wave of light, which got delayed making its way through the strand of silk, combines with a wave that curved around the silk, and with yet another wave that's reflected from an imperfection on another part of the strand. The troughs and crests of these waves don't line up; they interfere with each other. Some crests build to higher peaks together, and some crests are annihilated by troughs. Overall, the wavelength that reaches our eyes changed — and when the wavelength of light changes, the color changes. Because the interference pattern isn't the same for any two parts of the web (or even the same part of web viewed from different angles), we see lots of different wavelengths, and lots of different colors. Or the spiders are just trying to draw us in until we get too close. I knew they'd make their play one day.